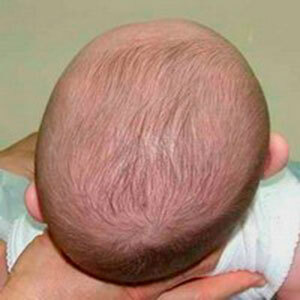 Example of plagiocephaly in infant. Credit: Medical advises, Плагиоцефалия, CC BY-SA 3.0. Plagiocephaly is a term used to describe an assymetry in the shape of the skull. It can be synostotic (caused by premature closure of the skull sutures) or non-synostotic (caused by the effect of sustained external forces on the soft infant skull) . This page focuses on non-synostotic plagiocephaly, also known as positional or deformational plagiocephaly or referred to as flat head syndrome. The skull covers and protects the brain and consists of several bony plates connected together by fibrous material called sutures. Sutures allow movement of the bones necessary to accommodate brain growth and allow moulding of the head during birth  and as a result the infant skull is vulnerable to deformation. Positional plagiocephaly is caused by pressure on the developing infant skull from an external force. This can occur in the womb, but more commonly develops post-natally. The "Back to sleep" campaign was launched in 1991 in the UK to reduce the risk of sudden infant death syndrome (SIDS). The campaign sought to educate parents and health care professionals about research that linked SIDS to babies put to sleep on their stomachs, and advise putting them on their back to sleep. According to The Lullaby Trust the incidence of SIDS has significantly dropped in the UK since the campaign was launched . Whilst practices may be different in other countries, in the UK many babies may spend significant amounts of time on their backs, either in their cot, in a car seat or in a buggy. The external forces from these firm surfaces can cause positional plagiocephaly. However it is still recommended to put babies on their backs to sleep as the importance of a reduced SIDS risk outweighs any potential dangers due to positional plagiocephaly . Congenital Muscular Torticollis can also co-exist with positional plagiocephaly in as many as 30% of cases . This is when a tight sternocleidomastoid muscle causes a restriction in cervical range of movement and predisposes one side of the posterior occiput to flattening. When viewed from above the head will have a parallelogram-shaped appearance with a flattened area to one side of their occiput posteriorly and a convexity to the forehead contralaterally. The ear on the contralateral side to the flattening may be displaced anteriorly. A head tilt may indicate an associated Congenital Muscular Torticollis. Alternatively the area of flattening may be even across the back of the head. This is known as brachycephaly. Positional plagiocephaly is diagnosed from the child's history and clinical presentation and does not usually require any imaging, however a skull x-ray may be required to rule out craniosytosis , which is premature fusing of the skull sutures. As diagnosis is largely based on observation, it is helpful to record observations from different views. This can be supplemented with photography. Clinically, where no equipment is available it may be useful for parents/ carers to take photographs periodically to identify change. A strip of thermoplastic material positioned around the infant’s head, transferred to paper and traced with measurements taken from tracings. Two‐dimensional head tracings taken using artist’s flexi curve placed around the infant’s head. Education and advice to parents/carers are the most important aspect of management, as they will be involved with every aspect of the child's daily care. During sleep, the "Back to sleep" advice should be followed: Baby should be placed on their back to sleep on a firm mattress and without the use of pillows or aids. Altering of positions for play e.g. supported side lying, tummy time. Encouragement of play and daily activities promoting visual tracking and cervical movement to side of flattening. Placement of their cot to facilitate desired direction of head turning. Reassurance to parents/ carers that positional plagiocephaly is not thought to be directly linked to any brain abnormalities, that it is thought to be a mainly cosmetic issue . A stretching programme if associated Congenital Muscular Torticollis. A shortened sternocleidomastoid muscle can cause flattening of the occiput on the contralateral side e.g. a child with a left sided CMT presents with a right sided positional plagiocephaly. Active and passive neck movements should be checked to rule out CMT as the cause of the plagiocephaly. Early physiotherapy input is required to restore the range of movement in the neck and improve the plagiocephaly . This is rare, but caused by the premature fusion of one lambdoid suture. It is identified by retraction of the ipsilateral ear and forehead and a trapezoid shape of the head when viewed fromabove . Premature fusion of a coronal suture resulting in forehead assymetry and diagnosed by examining orbital symmetry. Looking from the front the ipsilateral will be higher and wider and when viewed from above the ipsilateral eyeball to the side of forehead flattening protrudes . ↑ University of Rochester Medical Centre. Anatomy of the newborn skull. https://www.urmc.rochester.edu/encyclopedia/content.aspx?contenttypeid=90&contentid=p01840 (accessed 13 June 2018). ↑ Ellenbogen RG, Abdulrauf SI, Sekhar LN Principles of Neurological Surgery. Philedelphia: Elsevier, 2018. ↑ Reece A, Cohn A. Clinical Cases in Pediatrics: A trainee handbook. London: JP Medical Ltd, 2014. ↑ McGarryA, Greig RJ, Hamilton DRL, Sexton S, Smart H. Head shape measurement standards and cranial orthoses in the treatment of infants with deformational plagiocephaly. Dev Med Child Neurol 2008;50(8):568-576.